The history of where Iron Bank Coffee Company stands today is one of richness, dating back to somewhere in the early to mid 1800’s. This location has had several different names through the years, but one thing is for sure; then and now, the building is full of character and architecture goodness that has been recognized throughout the ages. The building itself has some controversy on when and who built it. However, most accounts point to Samuel Hatcher as the builder/architect along with Barringer and Morton. The “White Bank” is believed to of been fabricated in Pittsburgh while others say Europe. Either way, all the pieces were delivered by boat and bolted together. It is one of two buildings in Columbus at that time made out of cast iron, the old YMCA at Front Avenue and Broadway is the other building. The building was built in the mid 1800’s but is speculated that it was not completely finished until sometime after 1865, at the end of the Civil War. The building was known as the Georgia Home Insurance Company for many years. William H. Young came to live in Columbus, Georgia around 1855. As a young boy standing on the Alabama side of the Chattahoochee , he looked on at what is now Front Ave and Uptown Columbus knowing that this would be a great place to live one day. Through many different business ventures and several places of residence, W.H. Young became a very wealthy, well-known businessman. Upon his arrival he was quickly asked to be the President of the Old National Bank of Columbus. Later the bank was changed to the First National Bank of Columbus. W. H. Young went on to be a huge member of the cotton industry where he built the Eagle Mill and later the Phenix. Around 1903, the bank gained its nickname as the White Bank because of the white fabrication on the front. In 1919, the bank was completely remodeled. Up until it’s remodel the bank only occupied the North side while the Cowerdy Crockery Store occupied the South side. It was one of the finest china and pottery shops in the entire southeast. At that time the Georgia Home Insurance Company bought out the china shop and the bank and insurance companies worked together. The bank has many vaults that is said to of housed two million dollars in gold bullion during the civil war. The tale goes like this; When Wilson’s Raiders came through Columbus (apparently the war had ended but they did not know it yet), they came to the Bank of Columbus, and W.H. Young was there to greet them. The Raiders had been told that the Confederate gold had been shipped from Richmond further south for safekeeping. They searched the bank thoroughly but did not find the bullion. Young was a good friend to C.G. Meminger who at that time was Treasurer of the Confederacy and entrusted him with the money. The money was never found and is unaccounted for still. Some think the bank had trap doors. Unfortunately, that same day Mr. Young sat on his horse and watched Wilson’s Raiders burn his Eagle Mill to the ground with all its stores of cotton. After the war, Young used all of his personal fortune to rebuild the Mill, he named it the Eagle and Phenix, and to pay back the stockholders, which later forced him into bankruptcy. As you can see, Mr. Young protected the gold bullion at all costs and risked it all. 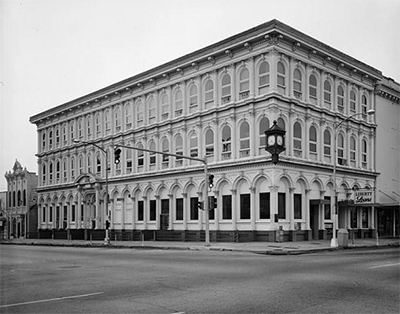 In 1976, the bank received a National Award from The Friends of Cast Iron Architecture for preserving and renewing the 1860 Iron Bank that was still a bank at that time. The bank is listed on the U. S. Department of the Interior’s National Register of Historical Sites and Places. The First National Bank of Columbus remained a bank until about 8 years ago. Iron Bank Coffee Company now gets to enjoy the rich history this building brings to Columbus and we are delighted to share it with you. Come by any time and check out the vaults…but only after you have grabbed a cup of the best coffee in town.